Mr. Pooh had been adopted at the age of 6 after him and his brother both were left to fend for themselves when their owner, a little old lady, had died. They were in the apartment with her until she was found, they think several days. It was clear by their condition that she had not been able to really take good care of them for some time. I had seen Pooh online on Petfinders.com, and at the time could not take two dogs. I wrote to the shelter and told them “If you are unable to place them together, I would really like to adopt the little red one.” I heard nothing back until one day three months later when I got a phone call which stated that his brother had been adopted and Pooh was sitting alone in his cage and had been for a month and did I still want him. I drove from Tampa all the way to Miami to pick him up. He was the cutest little mess I had ever seen. No one wanted him because he was in such bad shape. His eyes were totally crusted over, as he had severe dry eye and was mostly blind from lack of care, no hair on his back end because of mange and previously fleas, he was skinny as he had not eaten well. But beyond all that was the cutest little soul I had ever seen. I fell in love instantly. The staff seemed relieved and happy that I still wanted him when I saw him in person. He had no idea how to walk on a leash and he really could not see where he was going. Over time, with lots of love, care, good food and medical care he became one of the cutest happiest little creatures I have ever seen. Everyone who met him fell in love and the people who said “THAT’S the dog you picked?” finally could see what I saw in him. We spent 10 wonderful years together. After a weekend out of town, I came home and walked in the door as usual, said “Hi Lil’ Pooh!” and looked down. He didn’t move, and looked like he was sleeping. I bent down, and nudged him… Nothing… “Pooh?” I rolled him a little. His eyes were totally crusted over, worse than I had ever seen… He moved a little. I cleaned out his eyes and he blinked at me. “Oh, poor lil pooh!” I said and kissed him on the forehead. He was very hot. Then I realized he wasn’t really moving. I kept talking to him and rubbing him, but he seemed like he was paralyzed. I scooped him up and went to the ER Vet. Half way there he started trying to stand up. He was very wobbly, shaky and hot. They did x rays and blood work….. He had a mass/tumor in his chest pressing on his heart if not in it. It was also pressing against his esophagus which was shoved over at least 2 inches off of where it should have been. He had a bad infection and an inoperable mass. They tried to send me home with me with antibiotics to see if we could clear the infection. I sat with him, and he was shaking, and hot and falling over…. I cried and talked to him and tried my best to comfort him, but he just looked so frail. I couldn’t make him go on. I sat and hugged him and told him he wouldn’t have crusty eyes, or aching hips, or itchy skin or any pain anymore and that he would be free. He looked right at me and I know he understood. He was a smart little dog who understood English when he chose to. Josh, my ex and best friend, called and said goodbye to him on the phone and pooh kissed the phone and then kissed me. They had already put the catheter in his little leg, and it was wrapped in a snazzy red bandage. I held him in my arms and they gave him the injection. I stroked his little fuzzy head and told him to go to sleep and he would feel better….He looked peaceful, then went limp. Interestingly………..The tech at the ER clinic says “Oh my he looks just like my little dog who passed last month”….. After talking? I think it might have been Pooh’s brother Teddy! He was from the same rescue and right about the same time frame. They thought I was a little nuts, but as I was so sad and upset they humored me. I asked them to weigh Pooh after he passed. I had seen studies that said the soul weighs 4 oz……… he weighed 3 oz. less than he had only 30 minutes earlier. Right after he left his body my good friend Jen said that she saw white sparkles of light where Pooh used to sit in her house. The next night I heard his collar jingle in my kitchen. (His collar was in the car). 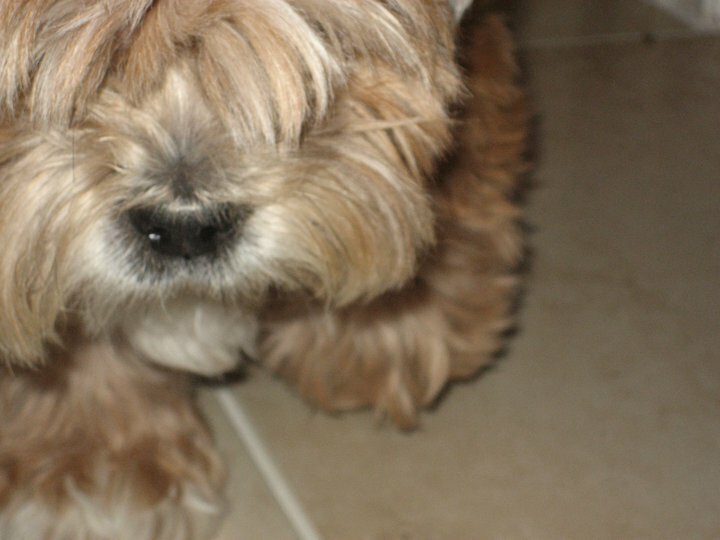 So, the little fuzzy love of my life, though gone in physical form, and missed beyond what breaks my heart, is still around as a little lhasa spirit. Looking back, I think he had been in the process of dying when I came home. I think he stuck around and managed to struggle back to life to say good bye to me, which I cherish and appreciate more than words could ever express. I love you forever Mr. Pooh Lhasa Apso. You came into my life and you changed me. Thank you for being a part of my life little dog. I could never imagine it having happened without you. Hard to let our animals go.